Enhance your design with architectural column covers and column wraps that withstand the test of time. Protean’s column covers and wraps are offered in aluminum plate, stainless steel and ACM composite materials. Available in round, square or oval shapes as well as in a variety of finishes, Protean column covers and wraps can be used in conjunction with Protean panel systems or as an accent to other materials. As an important complement to the overall design of your project, column covers and wraps should coordinate with materials used for adjacent walls. Our design team can help you spec the material, design configuration, and finish that best fits the overall aesthetic you hope to achieve. In addition to covering exterior supports on walls and entryways, Protean column covers and wraps can be used for interior applications in lobbies and hallways. Interior use provides opportunities to match internal trims, add color or otherwise enhance the building’s interior design. All column cover systems are engineered to meet design loads as required. Standard products come with a Twenty Year Finish & Five Year Workmanship & Durability Guarantee. 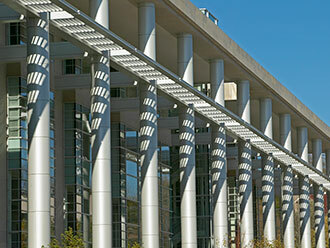 Majestic columns enclosed by Protean’s aluminum plate column covers line the Orville L. Freeman Office Building, home to Minnesota’s Departments of Health and Agriculture. AP-COL column covers, available in lengths up to 15′, complement the building’s metal wall components and provide a striking finish. 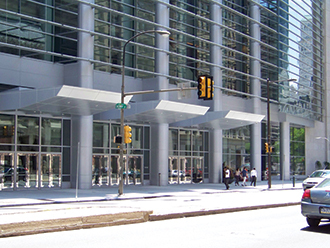 Protean’s AP-COL aluminum column covers helped create a bold and dramatic new façade for the Pennsylvania Convention Center’s one million square foot expansion. Protean’s AP-1125 aluminum plate system also helped create the contemporary urban aesthetic ideal for the center’s high traffic entrance.